Bruxism is known as the act of grinding or clenching your teeth. It can happen during the day or the night, and it is typically an involuntary action – in other words, you don’t always know you are doing it. While teeth grinding is more likely to occur during nighttime sleep, teeth clenching can happen during any time of day. In fact, many people clench their teeth and jaws during the day as a subconscious response to anxiety and stress or as they concentrate hard or exercise heavily. It’s not uncommon for long-distance runners to finish their workouts with sore legs as well as a sore jaw. The enamel of your teeth is the hardest substance in your entire body. However, under the pressure and force of bruxism, this outer layer of your teeth can wear down or chip. This exposes your teeth to decay and may also lead to sensitivity to hot and cold. In addition, if you have a crown, dental implant, bridge or filling, your teeth clenching habit can sabotage your restorative dentistry investment. Just like your teeth, your restorations simply can’t hold up against the extreme daily pressures. While teeth grinding is more likely to cause worn down teeth, teeth clenching is more often associated with painful jaw symptoms. The temporomandibular joint (TMJ) is what allows you to move your jaw. When you exert tremendous force from this jaw muscle for long periods of time, it is understandable why this joint will respond with discomfort and dysfunction. Excessive strain and/or damage to the TMJ from constant clenching leads to pain or soreness in the actual joint as well as clicking and popping while eating. Some people find that after working hard at a computer all day, exercising strenously or sleeping, their jaw is even difficult to open at all. If you can relate, you most likely have a teeth clenching habit that needs to be addressed sooner rather than later. How to Fix Daytime Clenching? 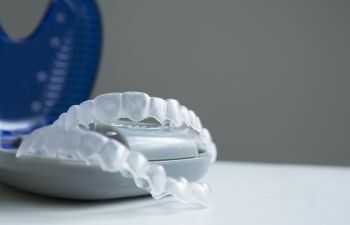 You may already know that nighttime teeth grinding can be treated with a custom mouthguard. But what if you clench your teeth during the day? The first step is to let your dentist know. At Gold Hill Dentistry, we listen to your concerns and work hard to determine the root cause of your bruxism. If it is stress or anxiety, we may suggest you find ways to relax throughout the day. If your condition is brought on by a misalignment, there are options to correct the way your teeth bite down together so that clenching/grinding doesn’t occur. In other patients, your medication could be causing the extra jaw exertion. Never assume that you have to deal with your bruxism habit on your own. Gold Hill Dentistry is here to help – for the sake of your daily comfort as well as your overall smile health.